Sometimes people ask me why I continue to take classes and workshops in floral design. I have always been most drawn to a designer’s process and I learn the most when I can watch them assemble a design in front of me. I’ve taken dozens of classes with florists, some of whom are now my peers. I’ve taken some lesson away from each experience whether it’s a small technical tip or a life changing view of a color or flower that I had previously overlooked. It’s so easy to fall into a familiar style of design when you do it day in and out but in order for our clients to want something new, we have to show them something new. I’m grateful that earlier this year I was able to take 3 very important classes with designers that I admire and that have informed my career in various ways. 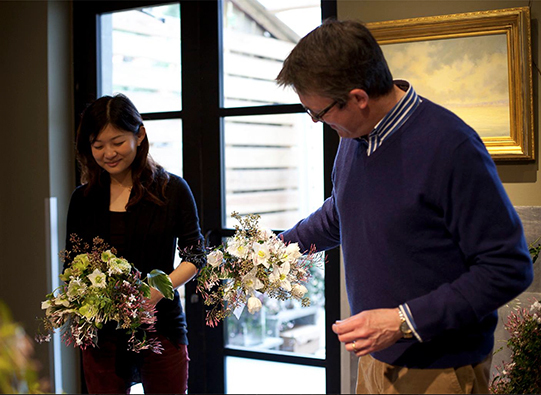 In February, my friend Christian Tortu came to Flower School New York to teach a class that he had never taught before on wedding design. He showed us images of some of his weddings that no one will ever see due to exclusivity or privacy and then we made two designs, a bridal bouquet and centerpiece. The techniques I took away from the day are firmly in my back pocket for future practice as I learn to make his techniques my own. It was a lovely experience and he is truly a wonderful teacher. This was my 6th time studying with Christian and I was inspired in part to write this post because I used a technique he taught me 18 months ago just last week for the first time! 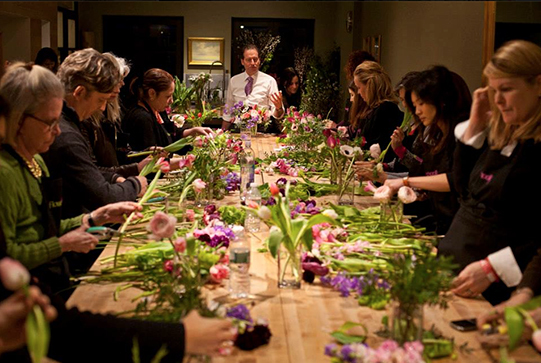 In early March, Charles Masson taught his first master class in quite a while at Flower School NY and I was able to attend. A photo of one of Charles’ designs used to hang on the wall at the Tudor City location of Flower School NY and when I went for my very first class I was so charmed by this design. The design was so charming, slightly disheveled and imperfect but clearly thought out and composed. That picture came to symbolize what I wanted to find in myself, my own style of design that blended all these aspects of designers that I admired. Charles was the only master designer at Flower School who was left on my wish list and I was so happy to meet him and make a design reminiscent of that photo I fell in love with 5 years ago. In mid March, my friend Jennie and I had a fabulous day studying with Shane Connolly. I’m happy to say that the designer who did the wedding of the Duke & Duchess of Cambridge is completely charming, amazingly talented and incredibly humble. We made a bridal bouquet and centerpiece during the full day class. We learned so many new techniques and also met some great designers! It seems like almost every floral studio offers classes these days and while I do think it’s great that there’s so much interest in floral design, as a very experienced “student” one of my biggest takeaways is this: The design that you make in class is to teach you that designer’s technique. That design does not become “yours” just because you put the flowers together. The teacher in fact did the design for you when they chose the flowers, the vase and the skill they wanted to teach. To grow as a designer and to truly learn you must take these techniques and practice them until they become your own. And practice some more. What I admire most about the 3 gentlemen I studied with this year is that their designs are completely original and their own. That is what we should all aspire to as designers. Our next class is coming up on Sunday 3/24. We’ll be making tall foyer designs with an assortment of flowering branches like Witch Hazel, Magnolia, Cherry, Pear and more. We’ll be accenting the design with seasonal flowers to create dramatic designs. There are still a few spaces and you can register here. Hope to see you soon! I'm in New York today teaching the Flower Shop Series at Flower School NY while the girls are busy at the studio working on all kinds of wedding projects for our non stop schedule these next few months. Today is day two of the series, students will be completing several orders this morning as though they are running their shops and then we'll be reviewing them. This afternoon we'll be discussing branding, websites and photography and lots of other information about how to begin in this field. 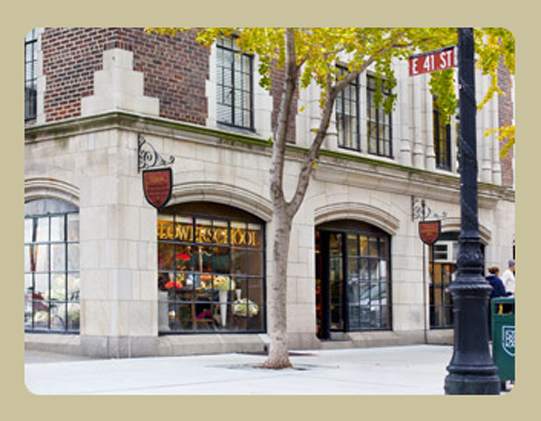 Flower School NY is where I began my floral studies so it's very special for me to be teaching here just a few years later. Please check out their amazing schedule of classes, here! I also taught two Peony classes in May, they were so much fun. 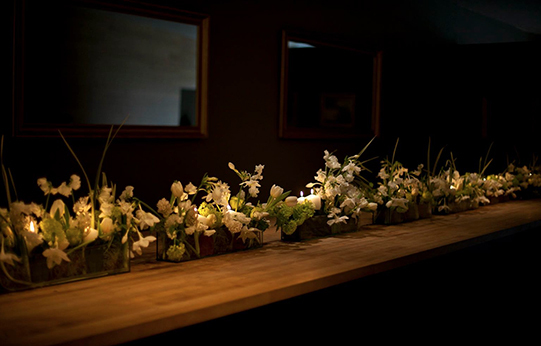 You can see more photos on the Philadelphia Flower School site but here's a peek. Did you know that in addition to delivering the most amazing floral designs in Philly and designing jaw dropping events, we also teach classes at our studio? We just had our Summer Wildflowers class and it was a blast! You can read more about it here or click classes in the menu at the bottom of your browser. Hope to see you at class soon! We were so excited to see the new issue of Brides Magazine, Sullivan Owen designs are featured twice and our fun classes at Philadelphia Flower School are also featured! I loved doing these designs for the gorgeous Hollywood Regency shoot. Love that cake! One of our gorgeous centerpieces was featured with other Philadelphia vendors. Photo by Lorraine Daley. Philadelphia Flower School was highlighted as a fun bachelorette idea. Check out our upcoming classes here. It’s time again for another Around the Studio post! We’re coming off a few really busy weeks, here's a bit of what's been going on... 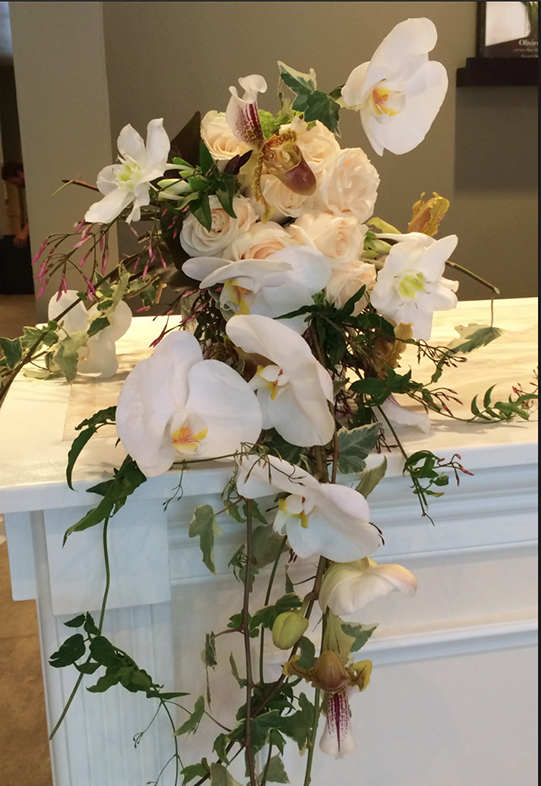 This past weekend I participated in The Modern Bride event at Busybee and cohosted by Swig. The event featured carefully selected vendors in all aspects of the bridal industry and we were so happy to participate. I designed several pieces for the event but these two were by far the most popular with the brides who attended. These earthy but edgy pieces would suit a variety of wedding styles. We’ve had a ton of deliveries in the Philadelphia Metro area and the color stories ranged from cheerful and wild to simple and understated. We work hard to find the most beautiful fresh flowers and unexpected details like this gorgeous blueberry branch and the results are happy clients and excellent reviews. This week we are preparing for all of the weddings we have in the upcoming Fall season. Organizing vases, finalizing flower orders and all that glamorous stuff. Our ribbon drawers were getting out of control but fortunately I found this amazing antique apothecary cabinet recently and now it’s displaying some of the vast ribbon collection which is sure to continue to grow. 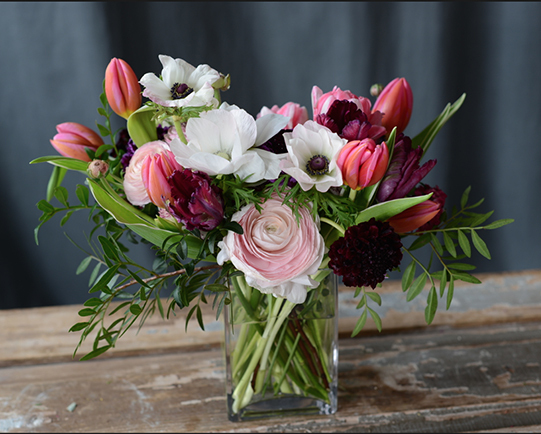 We hosted a really fun class at Philadelphia Flower School last week, you can read more about it here. Last Friday, Anthropologie in Newark, Delaware celebrated Spring and the store's one year anniversary. I started my former retail career with Urban and the whole company is very special to me so it was such an honor to be asked to participate in celebrating one of their great brands. Our designs are a favorite down at the company's Navy Yard headquarters and we love visiting their jaw droppingly gorgeous offices. The fun began with choosing Anthro's great vases and containers to arrange in. I brought a wide variety of flowers and was able to design for all the very unique vessels that Anthro sells. The fun thing about floral design is that if something holds water, you can design in it. These designs were created in cut glass jars typically used in a bathroom but they look just as fab with flowers as they do with Q-tips! As a special treat clients who purchased the vases got the flowers for free! Many lucky folks went home with a beautiful vase for their home and some flowers to brighten their day. We also raffled off two bouquets of those gorgeous peonies. I was busy working away to fill all those cool vases. The event was so much fun, clients seemed to really enjoy it and it was nice to bring Spring into the store with all those fresh flowers. Happy Anniversary Anthropologie Christiana! 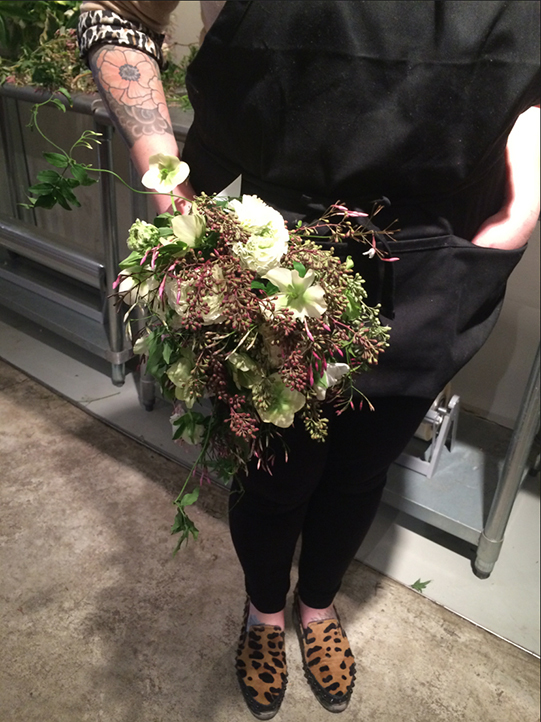 We had our first class at Philadelphia Flower School last Thursday night. It was cold and rainy but our friends made it out for this invitation only class. In return for wading through puddles, students worked with over 25 varieties of flowers and foliage to make beautiful compositions in a glass pedestal vase. Class begins with a run through of all the materials available to work with. We teach a bit about each flower or foliage, let students examine them and take in the scent and share any special care notes for handling the blooms. Then I did a demo of two arrangements in very different color palettes. Students were then unleashed on the bevy of blooms to choose their favorites for their composition. After working up an appetite designing their compositions, students snacked on local cheeses, veggies and an assortment of gluten free, vegan baked treats from Sweet Freedom Bakery and capped the night off with a champagne toast. All the beautiful designs were so unique and looked so pretty wrapped in our handmade packaging, everyone took home a vial of our Cut Flower Elixir as well. You can find out more about the many different classes we feature here or by clicking "classes" below, we look forward to seeing you soon!